The green movement is not just about the energy-saving benefits, but also very popular in home décor. Among the many elements of a home that can become more eco-friendly, green roof systems are more and more preferred as the place to start. Not only are they beneficial to you, as a home owner, but also for your wallet and your environment. Green Roof Systems: What Are They? A green – or living – roof is a cover that comes on top of your standard roof. The system includes plants such as grasses and lichens that are installed on your home roof. Making your roof green is an in-depth process that usually involves (1) water proofing your existent roof, (2) adding a root repellent system and (3) a drainage system. This way, there is little to no damage to your roof caused by the plants. Green roof systems have been long popular in Europe – since the 1970s – but they are only now gaining a sturdy foothold in the United States and elsewhere in the world. According to a recent survey by Green Roofs for Healthy Cities, the green roof square footage has increased with 115 percent since 2009. At the same time, owners of all building types, starting from residential dwellings to huge commercial complexes, are starting to see the economic and environmental benefits of installing a living roof. And the aesthetic benefits are not to be overlooked! Even though they can be pretty expensive to install, green roofs will usually make up for their investment in a matter of a few years. Green roofs are a proven form of insulation for your home. This means that home owners will use less energy to heat and cool their homes. As a matter of fact, research shows that green roofs reduce your cooling costs by up to 25 percent during the summer months. Green roofs are soundproof. For people who live in areas with a lot of air traffic, this benefit is the winner. You will quickly notice the benefit of sound proofing provided by a roof system. As we mentioned before, the aesthetic appeal is also a benefit. Although it may take some getting used to, your green roof can be the talk of the town if you pay attention to details and uniqueness. Also, green roofs allow you to reduce the number of roof drains; in some cases, they become completely redundant. How does it sound not having to clean any drains at all? 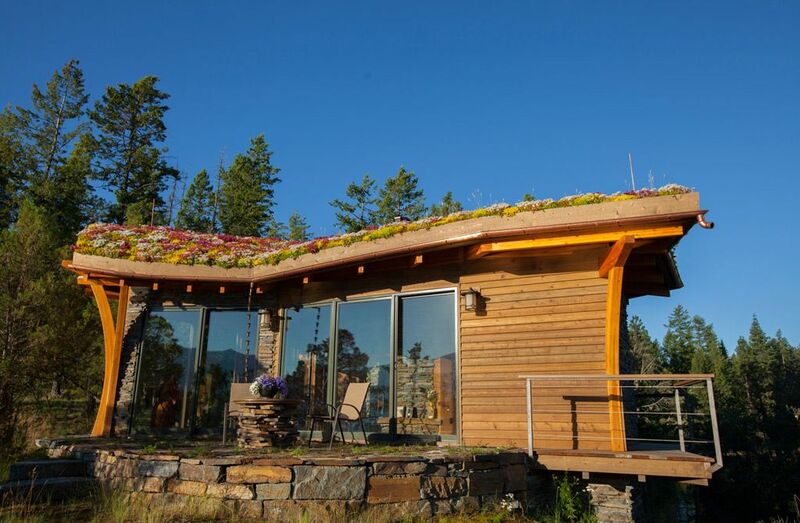 Now let’s look at some green roof systems you can install on your own home. 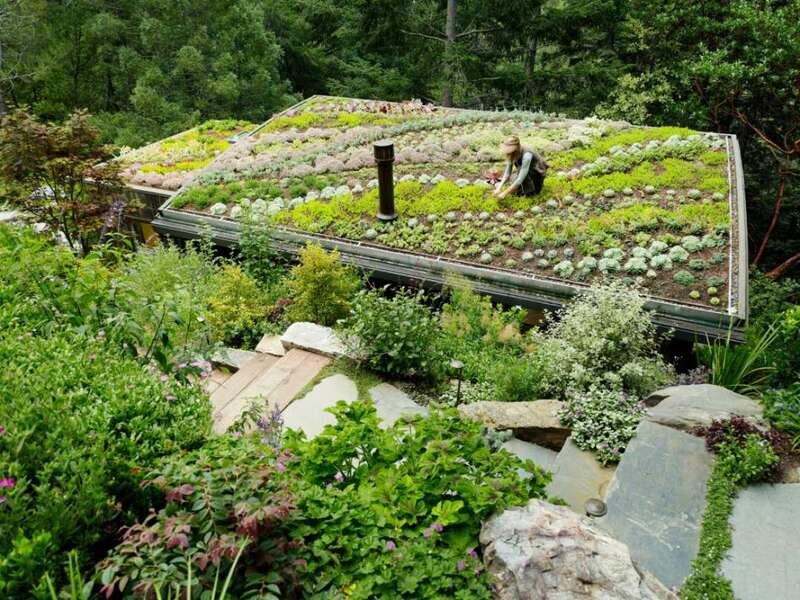 This is a typical extensive green roof that playfully incorporates multiple plants on the roofing system. Thanks to the slower rate of runoff, more stormwater can be percolated into the surrounding soil. A non-green roof usually sheds water at a higher speed, doubling the likelihood of surface erosion. This small yet cozy guest house is built as an annex into the side of the hill, opening up to the majestic views of Vail Mountain. However, the most important feature is the green roof that helps minimize the impacts of rain. Unlike what some argue, green roofs are not more susceptible to leaking. In fact, studies suggest that the longer life cycle of a green roof system – 30 to 50 years – is due to the protection offered by the waterproof membrane. The plants and substrate add to the natural barrier to weathering. 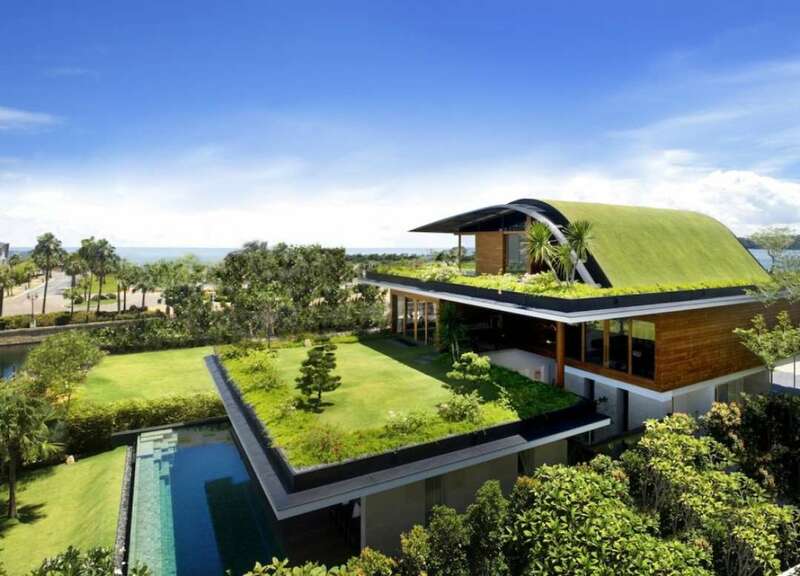 Located on a new housing estate on the island of Sentosa (adjacent to Singapore), this house and green roof system is ideal for home owners with modern tastes. Given that each plot was rather small and the neighboring houses are pretty close, the strategy was to provide as much privacy as possible. To open up the space, the terrace allows each story to have either visual or real access to the greenery. The result is a layered effect of multiple roof gardens. Then, the modern sloping of the upper roof allowed for a protective layer of lawn. Another home with a slightly sloping green roof, this cozy Idaho cabin blends perfectly into the landscape. 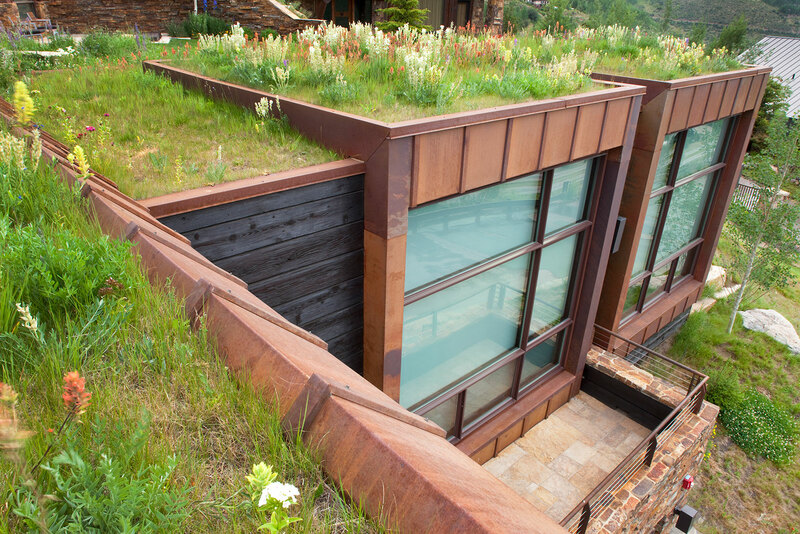 Designers have covered the green roof in four varieties of sedum and grasses. If you’re interested in reproducing this design on the rooftop of your own home, these are the elements of the green roof system: three layers of XPS insulation, a TPO type protection and expansion isolation sheet, a root barrier, all installed over OSB sheathing. It protects against rain and snow alike without leaking. This is the perfect example of a home that blends a modern design with eco-friendly benefits. 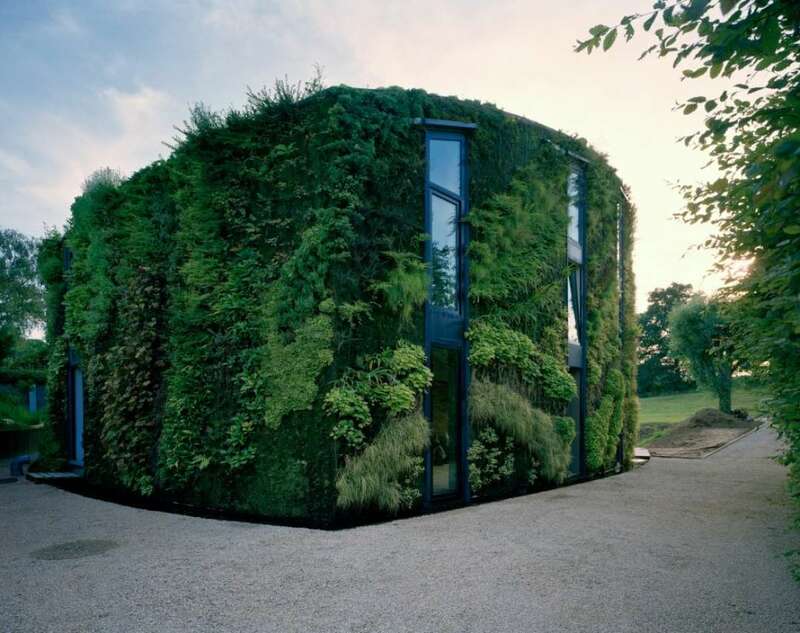 Situated on the outskirts of the Belgian city capital, the house has been designed by Philippe Samyn and Patrick Blanc. Notice that the four-story house is completely covered in plants on three sides (not visible in the picture, but one side is left open to expose the interiors of the ground, first and second floor). Also, the roof is equipped with greenery. The numerous plant species have been carefully selected for the lush façade, keeping in mind micro climates and sun patterns. The plant palette for the rooftop includes Cerastium, Aubrieta, Delosperma, Sedum, and Iberis. To further increase the green benefits, water is collected from the rooftop edges and used for irrigation; also, any runoff is recycled. There are many more other designs that you can try; the sky is the limit with green roof systems. Now that you are familiar with the benefits and the necessities of a green roof, you can start planning for your own. It’s a great way of being even more mindful of your carbon footprint, while also saving money in the process.